I generally approach each new day, after a cup of coffee, of course, with a fresh perspective. In other words, I see each morning as a blank slate just waiting for me to fill with unique experiences. Some mornings, though, are more special than others and the Universe hands me a gift. Today, I awoke to two such things. 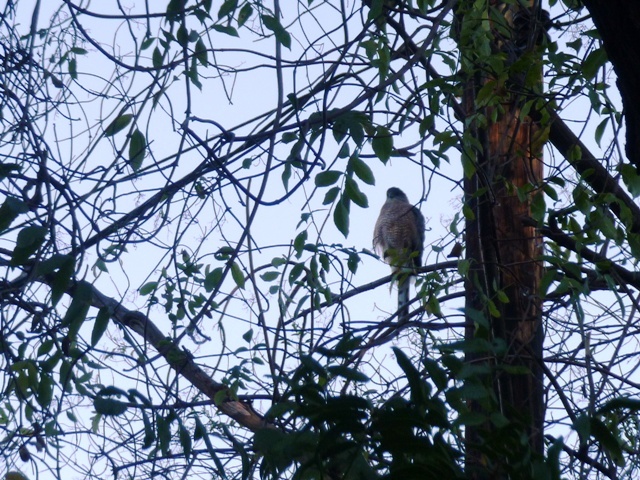 I'm pretty sure this is a Cooper's Hawk though there is a chance it could be a Sharp-shinned. My friend Tom (the gentleman who helped me build my veganic garden) would know for sure but he's not here at this moment so we're going with Cooper's based mostly on its size and its rounded tail with a white tip. I saw this feller (or lady) flying around the neighborhood this summer but only caught glimpses of him in the sky. In the past month, however, he's taken to perching on this branch in my Elderberry tree in the early mornings. I always know when he's arrived because all the other birds in the tree suddenly and frantically take flight. Both the Cooper's and Sharp-shinned Hawks eat birds. Since my neighbor below me has a very active bird feeder in her yard, it makes sense that this Hawk likes to perch in my tree. He's got a front-row seat to a prime buffet. What made this day special is that Mr. Hawk was facing me this morning. Usually, his back is to me and he's facing the feeder. So I got to look into his eyes, check out the gorgeous markings on his chest, and watch him preen with his beak and scratch his neck with his talons. I was outside with him for about 30 minutes. He's still in the Elderberry as I write this. I continue to be amazed that I can live in a city surrounded by 18 million people and see cool stuff like this. 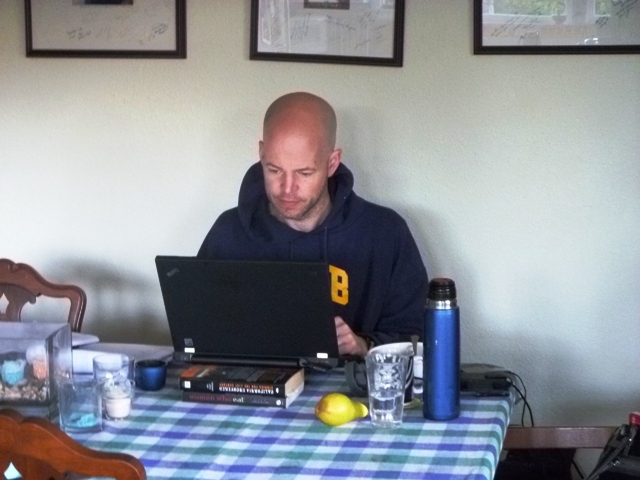 The other wonderful gift I received this morning is my hubby working from home. I love it when he does because I like the vibe in the house when we're here at the same time. We're both focused workers during the day so we don't do a lot of goofing around but we do take time to have a delicious, leisurely lunch together...sometimes at home on the front porch but more often out at one of our favorite vegan restaurants like Green Earth or Tony's Darts Away. It also means he gets to join me for Happy Hour, which generally starts around 4:30 or 5:00. Usually, he's wrapping up at the office at this time and about to step on the bus and/or train for his one and a half hour commute home and I'm left to toast with no one but myself (unless my neighbor joins me!). So today has started out with a bang and comes on the heels of a spectacular four-day weekend in Morro Bay where I celebrated by 41st birthday (I'll post some photos later this week). Life in general, and individual days specifically, just keep getting better and better. I'm glad I take the time to recognize, and honor, that. 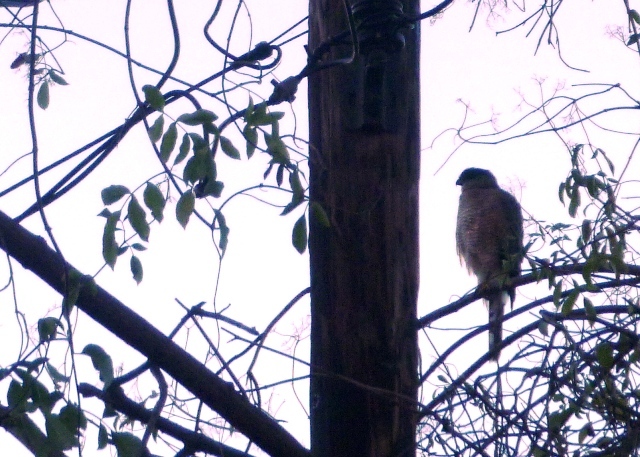 With a Hawk and a Hubby double-whammy surprise, it would be a shame not to.